888-LOG-GUYS is the best in the log home care business! 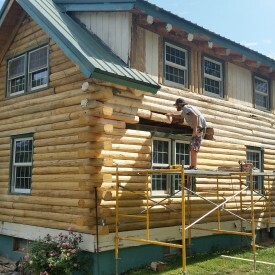 Although we do not offer log home construction services at this time, we do offer other specialized services such as log home restoration, log home repair, log home chinking and caulking, log home improvement, and log home maintenance. We know how to take care of your log home or log cabin, and we will work hard until you are completely satisfied! No job is complete until you are 100% satisfied with our work. Don’t just take our word for it! Call our number or ask for a quote from our website, and see the outstanding results on your own log home or log cabin! 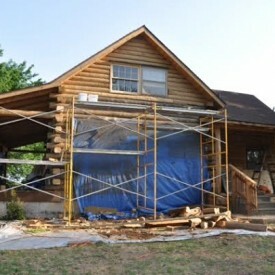 To completely restore a log home or log cabin, we use media blasting (corn cob, glass, sand, or walnut blasting) and sanding to prepare the log for cleaning with a borate treatment. Next, as per your request, we can apply an energy seal, chinking, or caulking in between the logs. 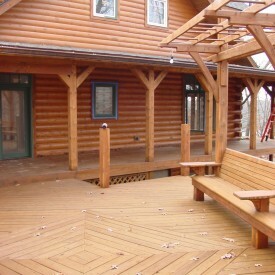 Lastly, we use the best products of stain to really give your log home the “WOW” factor! 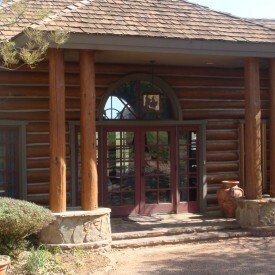 You will truly be impressed with the results of your log home restoration done by 888-LOG-GUYS! Call us for a free estimate or you can ask for one from our website! Logs are vulnerable to damage by water, bugs, insects, bees, birds, and severe weather. If you are experiencing log rot or if you have noticed holes in your logs, give 888-LOG-GUYS a call to look at the problem. We will determine how to fix your logs by either repairing or replacing them. 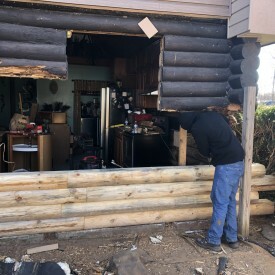 Our crew has fixed many feet of log homes; we have the experience you need to get your log home or log cabin in the Smithville Tennessee area back to excellent condition. Please check out our website for testimonials and request an estimate while you are at it! You may see gaps between your logs or you may not. Either way, if you do not have an energy seal applied to your log home or log cabin, you may experience invading bugs or insects, air drafts, or water leaks. Don’t put up with those things anymore! Our crew at 888-LOG-GUYS will get rid of those gaps in between your logs, and that will get rid of those pests and the stress that comes with them! Call our office today about chinking or caulking your log home or log cabin! Although log home construction is not a service we offer right now, we can build an addition to your log home or log cabin to make it even more beautiful and increase its value. Our crew has carpentry skills to complete log railings and log staircases. They will also be able to build decks, porches, and patios to beautify the exterior of your home. Whatever your dreams might be, let us know about them! We will help you to make those log home improvement dreams come true! 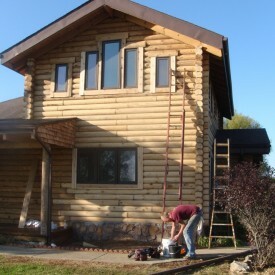 We are the log home maintenance experts, and we know how to manage the upkeep of your log home or log cabin. We will keep track of when your log home needs to be cleaned to keep it in the best condition. And you can count on our loyalty as our customer! You are not just a one-time project. We believe in building solid relationships, and you can trust us to always be there when you need our help in log home care. No matter if you have used our services before or not, give us a call or ask for a free log home maintenance quote from our website!